Home / The movement to oppose Big Business’ draft GMO Bill has begun again. Will this be the last time? If this draft bill is successfully passed by the Cabinet, this government will be the first government in Thailand to allow the unrestricted cultivation of GM crops. The Bill (officially the “Draft Biosafety Law”) will have a highly detrimental impact on Thailand’s food sovereignty and food security. No government in the last 20 years has agreed to take the country down this road! This morning, 13 November 2015, in front of Government House, Ms Nantawan Handee, Mr Ubon Yuwa, Ms Kingkorn Narintarakul Na Ayutthaya, Mr Nimit Tienudom, Mr Samart Sakawi, and Mr Wirapong Kriengsinyos, and around 150 representatives of nine civil society organisations, led by the Alternative Agriculture Network, Food Security Network and FTA Watch, marched to Government House to submit a letter to Gen. Prayuth Chan-ocha opposing the draft GMO bill as it will only benefit corporations. It also sets out why the signatories also oppose Thailand joining the Trans-Pacific Strategic Economic Partnership (TPP) which would allow a seeds monopoly and bring other impacts resulting from the expansion of patent monopolies and corporate intellectual property rights. Before submitting the letter, civil society networks and organisations carried out a symbolic action to mark their opposition. 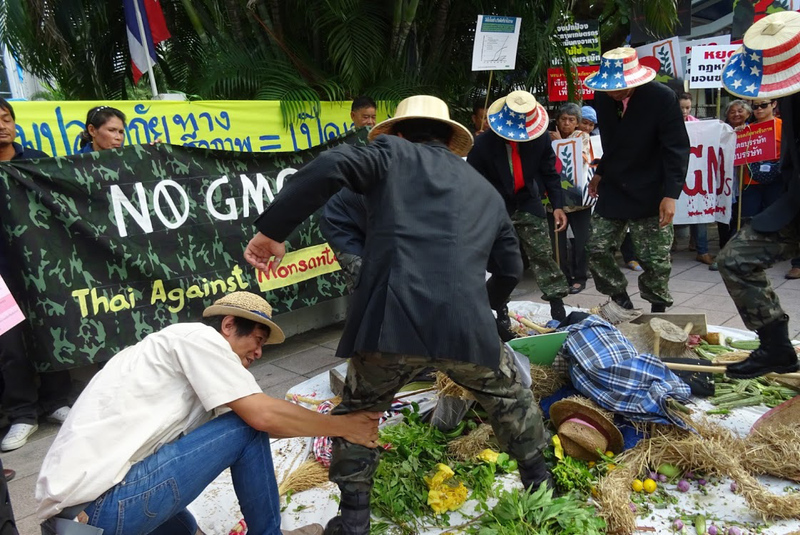 Men dressed in black business suit jackets, military camouflage trousers and boots, and wearing the hat of a rice farmer painted with the American flag, were seen treading and trampling over local farm produce, symbolizing the effect that the Bill would have of crushing our food sovereignty and food security. After the symbolic action, and after making statements to explain why they cannot agree with the draft GMO Bill, or any moves to bring Thailand into the TPP, representatives of nine civil society organisations, including, the Alternative Agriculture Network, Food Security Network, FTA Watch, Consumer Foundation, AIDS Access Foundation, Biothai Foundation, Sustainable Agriculture Foundation (Thailand), ThaiPlus.Net (TNP+), Alcohol Industry Watch, and Healthy Forum, submitted their letter of objection to Mr Suksawasdi Suwannawongse, Head of Public Liaison at Government House, as representative of the government. Mr.Suksawasdi informed the protest group that he would submit the letter to the Prime Minister's Secretary, the Ministry of Commerce, the Ministry of Agriculture and Cooperatives, and other relevant government units. Since the draft Biosafety Bill was submitted for consideration to the Cabinet, the Cabinet Secretary has requested comments from various different government agencies. If the Cabinet approves the draft bill, it will be submitted for consideration to the National Legislative Assembly who will pass it into law. 1. The National Reform Council issued a resolution to withdraw this draft Bill from consideration on 22 July 2015, because the Bill had been hastily submitted for fast-track consideration and contained clauses which would allow seed companies to escape responsibility for impacts or damages caused by GM crops. They also stated that it was unacceptable that the Drafting Committee for this Bill and the drafting process was not participatory, and did not seek to include the various sectors who will be burdened with the impacts of GM crops. 2.1 The Bill seeks to allow GM crops without enshrining the “precautionary principle”. This is a central principle of the UN’s Convention on Biological Diversity, to which Thailand is a Party. The principle is there to protect against the long term potential risks of consumption of GMOs, and to protect biological resources, and the potential impacts on our economy and society. 2.2 The Bill opens the door to seed companies being able to grow GM crops without restrictions, and without ensuring that they must take responsibility when damages arise from GM crops. 2.3 The Bill seeks to allow widespread open field testing of GM crops. This will risk GM contamination into non-GM crops and organic farms and willmake it more difficult to export Thai agricultural commodities. 2.4 Agriculture seeds will be placed in the hands of the giant agriculture industries. Farmers will not be permitted to collect seeds for growing in the next season, and will have to purchase new seeds in every season. Critically, farmers will not be able to develop their own varieties from the seeds, as they traditionally used to do. This is a violation of farmers rights and will even worsen their current plight. 2) Instruct the Ministry of Natural Resources and the Environment to put the draft out to consultation with small-scale farmers, civil society groups, independent academics, and businesses who may be impacted by its terms. The draft bill needs to be amended so that it contains the Precautionary Principle, protects against economic and social impacts, requires proper damages and restitution according to the Polluter Pays Principle, protects against contamination which will negatively impact the organic farming sector and biological resources. The participation of all sectors is needed to provide input to this draft Bill. 3) While there is no Biosafety law in place, we request that you issue a directive to relevant government units to take up the approach set out in the Cabinet Resolution of 25 December 2007 concerning theauthorisation of experimental trials of GM crops, as unanimously recommended by the Working Group to Study the Approach for Introducing GMOs and GM products Into Thailand on 23 December 2014. The authorisation of experimental trials of GM crops in open fields and commercial trials risks imposing negative impacts on small-scale farmers, organic farmers, on exports, on food security and food sovereignty of the country, given that more than 16 countries in the European Union have announced a ban on GM crop cultivation, and the majority of consumers in Europe and more than half of Americans reject foods made with GM ingredients. 4) Moreover, while the export business sector is pushing the government to consider joining the Trans-Pacific Strategic Economic Partnership (TPP), by claiming that Thailand may miss the train, and will lose out on trade benefits, we would like to draw your attention to the fact that in the above-mentioned trade agreement, there are clauses which would force Thailand to accept the liberalisation of GM crops and open the door to the monopolisation of seeds by a giant agriculture corporations. We call on the government of General Prayuth Chan-ocha to suspend consideration of this issue until Thailand has a fully democratic Constitution and an elected government.